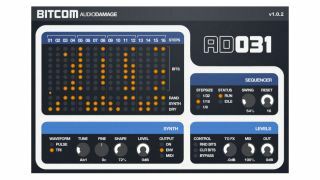 Audio Damage Bitcom: the "bit-bashing step sequencer with attitude"
Audio Damage Bitcom: don't make it angry. Or maybe do. Whereas some plug-ins are designed to add subtle vintage warmth, Audio Damage's new Bitcom is unashamedly modern and billed as a "bit-shredding digital banshee that beggars description and lives on the edge of instability". It features a step sequencer that drives a custom-designed bitcrusher that has a synth sidechcain. It promises to wreak havoc on even the most sedate sounds and can be yours for Mac and PC (VST/AU) for $39. Check it out on the Audio Damage website. Bit Banging: Bitcom's bit engine is unique; each step has eight switches that (to simplify matters greatly) turn individual bits on and off. So all 8 switches on, and the output is pretty much like the input. Start turning them off and Strange Things Happen. Synth Signal: Bitcom includes a simple monophonic synth that can either be always on, envelope driven, or controlled via MIDI. This is mixed with the input signal to create strange new sounds. Alternatively, Bitcom can be used without any input at all, as a moderately capable synth. Sequencer: Bitcom's step sequencer syncs to the host DAW. The sequence can be of arbitrary length from 1 to 16 steps, and the sequencer has internal swing.